NJBIA President and CEO Michele N. Siekerka issued the following statement regarding the Senate and Assembly’s passage of the $15 minimum wage bill (A-15/S-15) today. “New Jersey’s small business community wrote thousands of letters to our lawmakers and testified how they will struggle, stagnate or fail when this legislation is signed by the governor. With today’s passage, the urgent concerns of this community have not been heard. 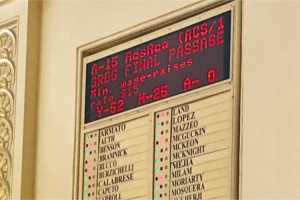 The Assembly voted 52-25 on a bill to raise the minimum wage to $15 an hour. The bill was approved by the Senate afterward and sent to Gov. Phil Murphy, who was expected to sign it. “For years, NJBIA has said any increase in the minimum wage should be done responsibly. This legislation falls woefully short of that standard, and our small businesses will bear the brunt of it. In the first year alone, they will see a 35 percent increase to their expenditures, when including increased payroll taxes as a result of the wage increase. “After the full phase-in, the minimum wage will have risen 70 percent from today’s level without the requirement of lifting a single skill. “It is extremely disheartening that there is no economic analysis that could ultimately serve as an off-ramp from this policy in the event of an economic downturn or natural disaster, as California enlisted when it raised its minimum wage to $15 an hour. Passing this bill without that economic analysis is fiscally irresponsible. “In New Jersey, there are nearly 600,000 employees who work for companies that employ 20 workers or less. These are the employers who are most vulnerable to a law which will ignore the reality of how they balance costs to revenues. These companies operate on the slimmest of margins, with business owners, themselves, challenged to make ends meet on any given day. “New Jersey’s businesses continue to face increasing challenges to survive. Just in this last year alone, the state budget was balanced on their backs with increased taxes, new costly mandates with expensive compliance regulations and more subsidies for energy delivery, driving up their cost of doing business even more. “Every day, our small business owners put themselves on a pathway to a life’s work, to provide jobs, give back to their communities and drive our economy. Rather than help them, our policymakers continue to throw roadblocks to that pathway. The response now is to vote every lawmaker who voted for this bill out of office. That is really how your voice can be heard. Pennsylvania, here I come. 4 Trenton City employees will join the roles of the unemployed, and all we do for the city and State will also leave. Bye bye NJ. As soon as possible we are out. Murphy has create a union and he is the head. So he runs your business so why bother owning one. This is the primary reason why I voted against Murphy. In 2016, the Democratic-controlled legislature passed this destructive legislation that would decimate the small business community. Fortunately, then Governor Christie, had the courage to do the right thing and veto it. I knew once Murphy was elected, there would be no common sense roadblock to stop this from happening. NJBIA and several other business organizations gave passionate, well-reasoned, logical testimony explaining the terrible consequences this bill would cause the small business community if passed. They received 3,000 letters from small business owners voicing their justified concerns and explaining they wouldn’t be able to survive without having to make very painful decisions. Unfortunately, as expected, everyone’s pleas and concerns fell on deaf ears to the Democratic majority and Governor Murphy. They are a bunch of ideologues that drink the Democratic platform kool-aid and refuse to the listen to common sense, reason, and do the right thing. The small business community and many of it’s employees will now pay the ultimate price and suffer the bad, unintended consequences. Because of this wage mandate, businesses will either leave the state, close, or raise prices. Employees will have their hours cut, lose their benefits, or have their job terminated and become unemployed. My heart goes everyone who will be hurt by this very bad piece of legislation.